When it comes to car seat safety, I have my own high standards. It's fairly easy to tell apart a great seat from an okay one just by browsing store isles. Some are flimsy, some are hard, some I would cry in as well if I had to sit in one! They are all tested to the same standards, but they are not all the same. 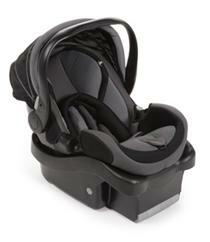 The generous folks at Safety 1st sent us the onBoard 35 Air Protect Infant car seat for review. As you may recall if you've been reading Eco-Babyz for a while, we have previously reviewed the Air Protect Convertible Car Seat for our toddler. When our first bundle came into the world, we bought a quality used infant car seat in great condition and were pretty happy with it. It has since traveled with my sister's fourth boy, let's just say it's very much used and loved! So we were looking for an infant seat for the November arrival of our baby. My husband and I have very particular requirements for car seats and side impact protection is a must! When I see a car seat that has nothing or very little to protect a child on the sides, it makes me cringe. A quarter of car crashes involving children are side impact collisions - I think all car seat manufacturers should take that more seriously. Rear facing 4 to 35 pounds and up to 35"
There is a lot we love about this seat and a few things we would like to see improved upon. It isn't too heavy or bulky and quite comfortable to carry thanks to the handle design. The side impact protection is the biggest plus of course. The design is sleek and modern, we are not fans of babyish pink and blue gear. The insert is perfect for newborns and thoughtfully designed. Installation is a breeze and the car seat provides an easy, stress free in/out of the car. Though the fabric seems super nice at first sight, it does pill easily over time and shows wear (that was glaringly obvious when we saw it in store). I also thought the canopy was pretty flimsy, wish they would make it a little more solid and sturdy. Another thing that concerned me are the plastic things on each side to thread through the seat belt for non-LATCH installation. You can see my toddler holding on to them below, they are a little sharp and look like a good place for infant fingers to get stuck. Also an important thing to note, the annual HealthyStuff.org car seat ratings give the onBoard Air 35 Infant Car Seat in Silverleaf a medium level toxicity score of 0.3. There was no lead detected in it, but there is some bromine in the base, clip, and seat. Most car seats receive a medium score, but there are quite a few with a high hazard score and very few with a low score. This is just my general concern, there is no reason that car seats that are designed to protect babies should have lead or any other toxic chemicals in them! Wouldn't you agree? I hope all car seat manufacturers pay more attention to this and start making car seats that are truly safe, not toxic. It's small enough for a preemie and large enough for our 26 pound toddler (though she is 36" tall, just over the limit)! Since it is a little roomier to fit a baby longer, it may not fit in all sedans or compact cars, especially behind a seat. You may want to try the fit before buying it. That is the same reason we couldn't keep the first Air Protect Convertible seat we received since it wouldn't fit rear facing in our Honda Accord. Other than that, it is a great seat with safety being the number one reason to buy it! Make sure you properly install your car seats folks, they do save lives! Visit Safety1st, connect with them on Facebook and Twitter! this seat is on a list of my top 5 to check out. THANK you for the review!